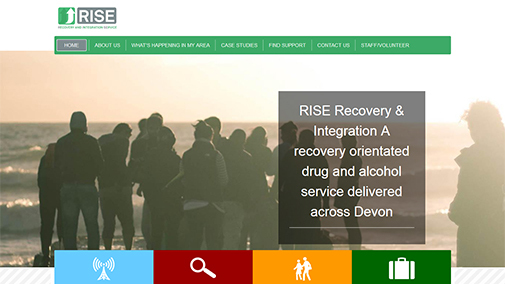 The RISE Project was launched in April 2014, to provide a Drug & Alcohol support Devon-wide. RISE came to Cosmic in need of a modern, responsive content management system based website that would let them show off all of the amazing work they are doing within the community, and the ways that they can help you. Alongside the website's beautiful design, the website has the ability to show recurring events and meeting that RISE are holding, such as Alcoholics Anonymous and Narcotics Anonymous to name a couple. There are ways of finding support if you are in need, as well as case studies and opportunities to volunteer your time. The website is responsive, which means it adapts to the device you are browsing on and alters it's appearance to give you the best possible experience when browsing on the go or on your sofa.